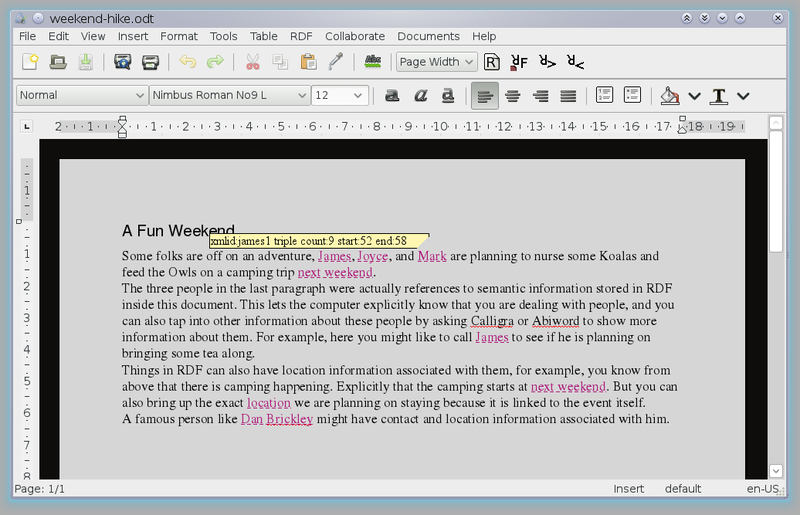 Abiword now has growing GUI support for editing RDF in ODF documents. Much of this support compliments what is available in Calligra for RDF handling. 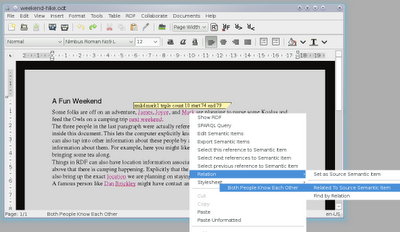 There are some areas where Calligra has more features and some areas where Abiword now does. Hopefully both will continue to have a large and growing shared feature base. As some folks will know, ODF allows one or more RDF/XML files to be shipped in the ODF file, and for that RDF to be linking to the document content from the content.xml file. This means that you can explicitly say that a 1/2 inch bolt is from a particular maker and was procured on the 3rd of January 2012 by going to their office at geolocation ?x. Handy when you are reading the document a year down the line and want to know which office you bought the bolt from and the exact length of its thread. Looking at the below image, one can see the purple underlined pieces of text. Each of these has some RDF associated with it. 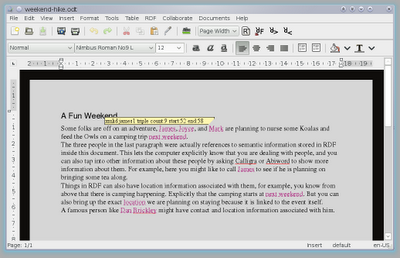 The citation to Dan Brickley has both contact and location RDF associated with it. Looking at the toolbar, towards the right side you see an "R" to start a change tracked document, and the "RF" button. Sorry about the images there, I draw at the 3 year old level so my icons are not quite polished shall we say. Anyway, the "RF" button selects this reference to an RDF item. So if you are between the "am" in the purple "James" then the whole word will be selected with this button. The ">" and "<" buttons then allow you to move to the next and previous reference to the selected RDF item. As you notice another purple James later in the document, this is the second and only other reference to him and you can move between them using these buttons. These purple links I call "RDF links", which is a bit of a play on hyperlinks or bookmarks. Behind the scenes they are implemented using xml:id values and pkg:idrefs to those from RDF. A feature added in the last days is the ability to capture and navigate by the relation between two RDF links. This is currently done by selecting a "source" link and then clicking another rdf link and setting the relation to the source. So in the below screenshot I am saying that Mark foaf:knows James. You will also notice the "Find by Relation" option which I can then use to see the people that mark foaf:knows. In the spirit of the foaf definition, I have made this a symmetric relation. So there is no stalking, or "following", if James knows Mark then Mark knows James. Asymmetric relationships are also possible, like son, child, or contains. I am hoping to add this feature to Calligra too in the future as the relations between RDF objects is one of the more powerful features that can be offered by using RDF in a document. 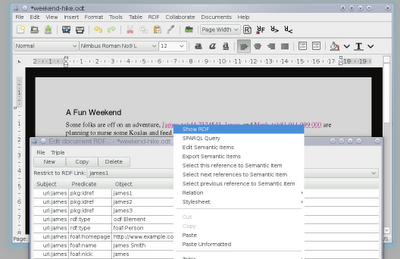 Note that the prev/next RDF item buttons work with relations. If I pick mark and navigate to the James he knows then I can "next" from that james to select the second reference to James. This is one recurring theme to RDF in ODF, that RDF objects like contacts can be cited or linked zero or more times in the text content of the document. If you are not squeamish about your triples then the "Show RDF" option for an RDF link will let you get right at them and edit away as shown below. There are a few technically cool things about this dialog: firstly the "Restrict to RDF Link" combo box lets you select one or more RDF links that the triples will have to be associated with, and secondly abiword makes sure any edits you make are properly linked to the RDF link you right clicked on. What I mean by this last bit is if you right click the RDF link "alice33" add a new triple "uri:alive myvocab:likes uri:bob" then abiword will add the triple "uri:alice pkg:idref alice33" for you. This is sort of having abiword do what you mean in that you want the new triple to be associated with the link but don't necessarily want to have to explicitly say it all the time. By choosing to edit the RDF for the link you have already explicitly said once that you want these things to be linked. This also applies if you change a subject, uri:alice to uri:amanda will update the pkg:idref values for you. Keep it linked, keep it valid. Going one level deeper, the above dialog is actually a subclass of a restricted RDF model created using SPARQL. The SPARQL model is read only, and the subclass, RDFModel_XMLIDLimited handles mutations by creating a wrapper object which takes care of the automatic triple relinking mentioned above. Those still awake might like to see the abiword trunk code for src/text/ptbl/xp/pd_DocumentRDF.cpp. This is part of an ongoing mad hacking sprint that is leading up to a talk at LCA 2012 which starts in a week. 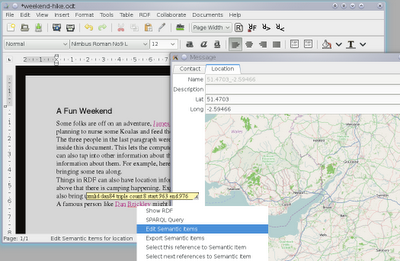 Many of the things I mention here are not in trunk yet, and only tested on Linux/GTK+3. Those in Ballarat in a week might like to pop in to the talk given my Martin and myself on Friday the 20th. I helped design ODF's RDF support, so this is great to see. I'm a little unclear: do you support the metadata field? 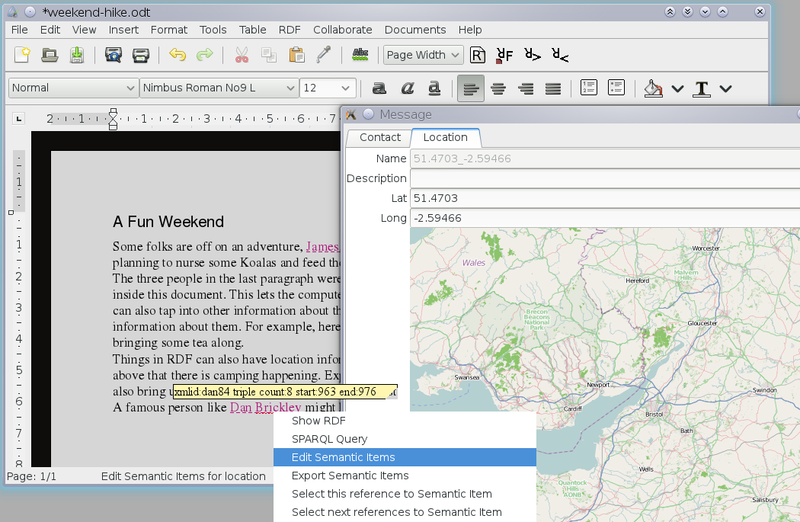 ODF+RDF coming soon to an abiword near you!